Warhammer 40,000: Dawn of War: Dark Crusade is the second expansion to the PC-based RTS game Warhammer 40,000: Dawn of War developed by Relic Entertainment and published by THQ. 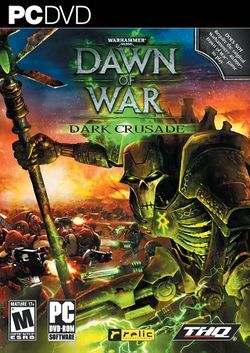 Based on Games Workshop's popular tabletop wargame, Warhammer 40,000, Dark Crusade was released on October 9, 2006. The expansion features two new races, the Tau Empire and the Necrons. Including the Imperial Guard from Dawn of War's first expansion pack Winter Assault, this means a total of seven playable races in this expansion. Unlike Winter Assault, Dark Crusade is a standalone expansion that does not require prior installation of Dawn of War or Winter Assault to play, allowing the user to play as all seven factions in both single player Skirmish and Campaign modes, but only allowing the player to use the new races in multiplayer (unless they also have the previous games installed).